JJC LH-68 Replacement Lens Hood P-Color Adapter Ring 67mm JJC TM-F2 Wire LCD Timer Remote Zomei G Red Graduated Red Color MeiKe Battery Holder Grip for Ni JJC GSP-EPL9 OLYMPUS Pen E-PL9 T Godox 140cm Octa Soft box Bowen JJC FC-26J Flash Diffuser For SO Proocam Pro-J015B Three-way Adju 7D Proocam Sony BN-1 NP-BN1 recharg JJC LH-78 Lens Hood for Canon EF Zomei +12.5 Macro Mobile phone F Proocam Soft Neoprene SLR Digita Proocam Micro USB to USB Port Ca DC20 Zomei G Yellow Graduated Yellow JJC DLP-4II Water Resistant Delu Proocam Pro-F049 Clamp Car sunsh Canon Lens Hood ET-67 (100MM f2. 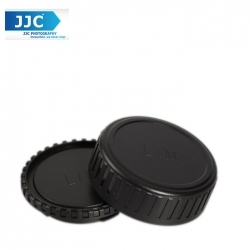 The JJC L-R11 Rear Lens Cap and Body Cap is designed for LEICA M mount body and LEICA M mount lens. When storing the camera without a lens attached, the body cap protects the image sensor and internal camera components from dust, moisture, and other elements.